On the surface The Artist, directed by Michel Hazanavicius, is an ode to a simpler time in movie-making history. Set in 1927 Hollywood at the dawn of the talkies, the black-and-white silent movie tells an old-fashioned love story with plenty of heart and just as much style. But that's not the whole picture. The revisionist film has fun playing with those conventions and also has a much more complicated DNA. That may be one reason The Artist has been nominated for so many honors and ten Academy Awards, including Best Director and Best Picture. 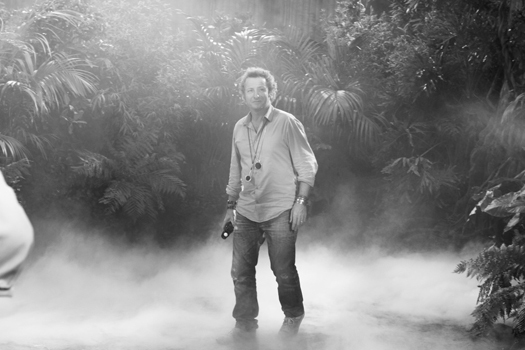 The film has also earned director of photography Guillaume Schiffman, AFC (above right), his first Oscar nomination for Best Cinematography, one of eleven industry nominations he's received to date for his camera work on the film. Under the direction of Hazanavicius, Schiffman's job was to frame the past—specifically the silent era when stars were born and big studios reigned but also what came after, from fizzy Fred Astaire and Ginger Rogers cocktails to darker Wellesian tragedies. And, as he tells us, not necessarily in that order. Shooting color film in a 1.37:1 aspect ratio at 22 frames per second, Schiffman blended vintage and modern techniques to bring Hazanavicius' vision to life. He captured it all with PanArri 435 ES and Panavision Super Speed MKII cameras on Kodak Vision3 500T 5219 color stock later converted to black-and-white at Laboratories LTC in Paris. We talked to him about what was old, what was new and what was borrowed, plus what it was like to shoot on a set that wasn't recording location sound. StudioDaily: Director Michel Hazanavicius has said he wasn't using silent films as an ironclad genre template but more as an open format, to leave room for other styles and genres that came much later. How did you prepare for the shoot? Michel and I saw so many movies before we started our tests. He gave me 20 or 30 specific movies to the watch, and then we kind of narrowed it down to about four or five that we would specifically honor in the film. He didn't want too many references cluttering it up. There were two films, one from the 1950s and the other from the 1960s, that were particular influences. We talked about all the references ahead of time and we also talked about how specific scenes could reflect the different styles. But once we started shooting, we didn't think about the references on set—we just did our work. Michel does his own storyboards and I framed the shots with him. I work very instinctually but we also probably did more tests on this film than ever before, more than a week of tests. We had everything in mind but it was during those tests that stylistic choices became clear to us. We had no time to wait, either—we had only 35 days to shoot the entire film. Jean Dujardin as George Valentin and Bérénice Bejo as Peppy Miller in the film's high-key lit closing scene. The film strikes a delicate balance between dramatically different lighting styles. We see the soft focus used exclusively during the silent era, as well as the high-key lighting of Hollywood musicals from the 1930s and '40s, where everything sparkles. But we also get the moody, low-key lighting Orson Welles and Gregg Toland used in Citizen Kane. How did you modulate between these styles so that it made sense to the narrative? We used the storyline to tell us how to light the shots. In the beginning of the film, everything is in the light and it's brightly lit. 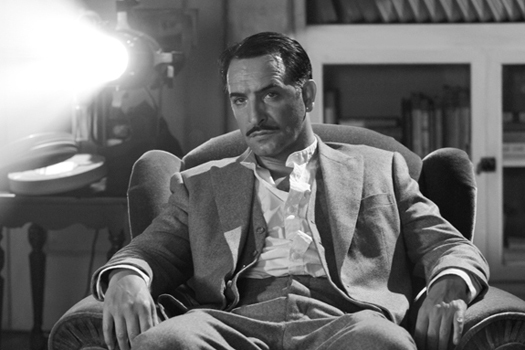 When Jean [Dujardin]’s character takes a darker turn and is more in the shade, we used the low lights. As his star falls, Bérénice [Bejo]'s Peppy is simultaneously in a shiny atmosphere, where everything reflects light. And when they are together at the end, they are obviously back in the light, on a brightly lit stage like you'd find in a Ginger Rogers and Fred Astaire movie. During the tests, Michel and I talked about all the references and all the movies that we'd seen, for example, how the blacks in one would work well in a particular scene, or how the grays in another one would be ideal. That's the gymnastics of it: you've got to think about all that on one level but kind of put it out of your mind while shooting it so your camera work is completely normal and organic to the story. Then it's really about just making a good story that also happens to be a black-and-white film. Bejo's Peppy Miller in what Schiffman calls her "shiny" phase, when everything, including her tears, reflects the light. Why did you and Michel decide to shoot in color and leave the monochrome process for the lab? We made some tests in 200 ISO black-and-white stock but 200 ISO is not enough, and we had to use too many lights to get what we wanted. And it still didn't look right. Everything was too bright and too sharp. But when you shoot with 500 ISO, you get much more grain with a lot of wonderful gray tone in it. With the 500, we had a range of tones to explore that we could use at different stages in the movie. Also, we wanted the film to have a lot of texture: we didn't want it to be too hyper-realistic or too modern looking. Did you have to modify your setups in any way when shooting color for black-and-white? And did you use any special filters? I worked with a lot of old lenses, with special rigs, to play with depth of field. I was very shy with filters, though. I typically use soft-effect glass on closeups, so I went to Dan Sasaki at Panavision to get some glimmerglass filters to try out. Dan was really fond of our project and he worked with us to dig up different lenses and filters. But in our tests, the filters were always a little too bright. Guillaume Schiffman taking a light reading on set during one of the many film-within-a-film vignettes. The last set of tests involved our production designer, Laurence Bennett, who was tasked with making all the various wood panels in the mansions and offices in a range of colors. Through that process, we found out which colors worked well for the blacks, which worked well for the whites and which worked well for the grays. There were always some surprises, of course. When our costume designer Mark Bridges showed up with a bunch of period dresses in hard colors we thought they wouldn't work, but they turned out to look really great in black and white. What about all those vintage Kliegs and other lights seen on camera in the various film-within-a-film scenes—did they actually work? Jim Plannette, my gaffer, is a really knowledgeable guy, and he found all these period lights that we then rebuilt, so we could use them in the scenes. When I pull out in these scenes you can clearly see the lights functioning as they would on an old film set, so it was important that they actually did. Were any of these lights finessed in post? No, not at all. The only thing done in post was to clean up some of the exterior street scenes, to remove things that weren't supposed to be there or wouldn't have been there during the period. No, those lights were all rebuilt so they were completely like new! Larry Mole Parker of Mole-Richardson has a kind of museum of old lights on a soundstage in Hollywood, and he loved working on the project to help us bring those lights back to life. Jean Dujardin's Valentin reflects on his past work amid the low lights. You were also shooting at 22 frames per second and framing for a 1.37:1 aspect ratio. Did this change how you captured the action or what Michel asked the actors to do? The choice of 22 fps was really because we wanted to show something a bit different, to create a unique mood. We didn't ask the actors to do something different. Basically they acted normally and spoke their lines as they would have during a normal shoot. Occasionally Michel would want to linger a little longer on actors in certain scenes, but the frame rate didn't drastically change the way we all worked. Did any films in particular directly influence how you framed your shots? The screening room scene was exactly like the one in Citizen Kane—we loved it so much that we wanted to reference it directly—but most of the other shots were not necessarily directly linked to a specific reference shot. The aspect ratio, however, was a truly great frame to work with, especially when framing people. I loved using the square for closeups but you get so many other framing options within that square. I wouldn't say that I'm used to working within it but it certainly was different and it definitely was fun. What did it sound like on set? Beside the two French leads, the rest of the cast is American, as is most of the crew. But you, Hazanavicius and those from the production company are also French. Were both languages spoken during production? The actors were speaking their lines as we filmed, as they normally would. Michel was talking to Jean in French, but he, and Bérénice and I also speak English, so we would speak in English to the Americans and to each other in French or English. That's what was so great about doing a silent film; we could communicate however we needed to in the moment. Michel was also very specific about using music to create a mood for the actors, to great effect. He used a lot of reference music, and he was like a DJ on the set: he always found the right music to play to put the actors in the right mood. When the scene was dark and dramatic, he found rich and stirring, terrific music to play. When the scene required freshness and light, the right music helped buoy the collective mood on set. I've read that one reason Uggie the dog performed so flawlessly was because his trainer was able to shout out commands during takes. Was any of this distracting? Yea, those commands made it really easy for the dog—a very smart dog, no doubt—but it wasn't easy for the actors. Jean would be doing these extremely emotional scenes and saying his lines and then you'd hear "Go Uggie, jump Uggie, cry Uggie, down Uggie," etc. It was difficult to stay in the moment with that swirling around you. For me? 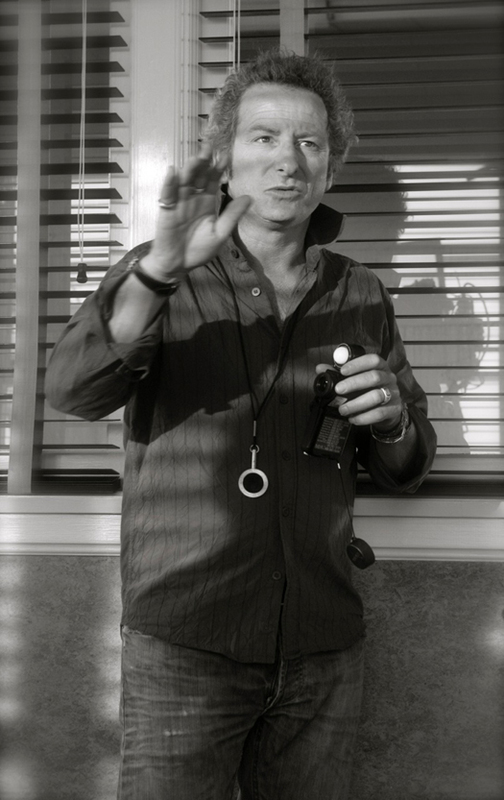 This is my third film with Michel, so I'm used to having him yelling at me. No, seriously, it is always a little crazy on a set, with everybody yelling out different things from time to time. As a DP, you just have to concentrate on what you see. But sometimes, in the case of the dog trainers, they were very close to me and the camera, so it was hard. For one scene I think I actually put earplugs in so I could concentrate better. Schiffman on the Paramount back lot where the 35-day shoot took place. I'm curious about your personal film influences. You were raised in Paris by your American father, a painter, and French mother, Suzanne Schiffman, an assistant director and screenwriter who made many films with Truffaut and Godard. What kinds of movies did you watch growing up? A lot of American movies, actually. My house was directly across the street from an old theater that used to play old American movies. I went five times a week, and then my mother took me to the cinémathèque to see new movies. Both of my parents were very fond of American movies. All those films I watched growing up are just a part of who I am. It's actually a bit emotional for me to reflect on this in retrospect, because my Dad is not alive today and he always told me, 'You really need to go to Hollywood and make a movie.' I'd always say, 'OK, Daddy, maybe I will someday." He saw a lot of movies when he was growing up in New York, and I think he would have loved knowing that I've finally made a Hollywood film. I've done two films since I did The Artist, including another period drama [the Mad Men-esque comedy Populaire, which also stars Bejo], and I'm about to do this small picture, a road movie with Catherine Deneuve. I really like doing different kinds of films, and I certainly want to work again in the States. I would love to work six months out of the year in France and six months in Hollywood—that would be ideal. Why do you think The Artist has been such a critical success? It's really a big love letter to Hollywood movies, but because we are French and came to Hollywood to shoot a story about all the American movies that we love, it comes across as the truly honest love declaration that it is. We're not preaching about French cinema and our own history. Congratulations on your BAFTA win. Were you at the ceremony? Thank you. Unfortunately, I wasn't there. I always seem to be at the ceremonies where I'm supposed to win but don't and never at the ones when I win.